So. There is no denying that this year has been unseasonably hot. I'm amazed daily that while it is technically still Spring, we've had numerous days in the 90°'s here in NW Indiana ...and I've been told that we're not the only ones. I'm not sure what everybody else is doing to keep cool, but I've been turning to popsicles. As a matter of fact, I may be just a teeny-tiny bit obsessed with them. Over the years, I've amassed a pretty hefty folder-full of ripped out magazine pages laden with numerous varieties of popsicles that span all the colors of the rainbow. And beyond. I've bookmarked them, both literally and virtually. I created a pinboard that starts me dreaming every time I take a peek. And I don't see my current obsession with them cooling down (ha!) any time soon. So that, my friends, is why I am declaring this the Summer of the Popsicle! It's going to be popsiclepalooza all summer long in my house. And what better way to have fun and be able to try all kinds of new popsicles than to invite you to join in my madness!? I will be keeping this "event" open for the rest of the Spring and throughout the Summer. I hope that you will add a link to any of your past, present, and future posts that celebrate the joy that is a posicle...a paleta...an ice pop...a push pop! I will add all links to my Popsicles & Paletas Pinterest board and tweet them, as well. And once summer concludes, I will do one giant (hopefully) round-up post featuring all of the popsicle posts that helped me beat the heat! So go ahead and start adding your links below! Use of the logo is optional, but always appreciated. I would love it if you'd link to this post (especially in current posts) or feel free to share it in your side bar...just so that others can join in finding and sharing their cold creations, as well. 25. Red, White & Blue Boozy Popsicles – Made With Dry Ice! 28. Paletas de Pepino y Uva ~ Cucumber and Grape Pops! That is too funny! I actually checked your site yesterday to see if you had a pistachio paletas recipe. I am a huge follower and lover of your blog, you make fantastic food! I am still waiting for the heat Heather, but I will take popsicles any time of the year! Your pinboard is incredible, I'm already hyperventilating over so many of those gorgeous popsicles, count me in, I'm off to find some popsicle molds! What a"cool" idea Heather. I will need to see what I can up with. Perhaps something from my Pin Board too. I absolutely LOVE yours!!! I'll add your Logo when I update for June in a few days. P.S. I'm also going to add your Logo to my Something on a Stick board. ha ha ha, thanks Louise! And thanks so much for sharing it...I would LOVE to bring popsicles to the picnic this year! You know I love a good popsicle. Sounds like lots of fun. Will try to join in here and there. I'm also in a popsicle mode and have been looking at making my own. Do we have "popsicle fever?" That's almost an oxymoron! =) We definitely have popsicle fever. Your inspiring me! I'm already starting to think about mad flavors :) Hang in with the heat and bbq lots..
What a great idea. I'll have to go invent a popsicle recipe to join in on the fun. Does my mango on a stick count? I love this idea…I will have to think up something yummy and join in on the fun! Thanks for inviting me to share my boozy popsicles. Great roundup you have going on! Good luck with the dry ice experiments! I am MADHU from Delhi Capital of India, I have submitted my popsicles on your blog. I hope it will be qualified for the event. You have a nice blog. i will be glad to follow you. Do follow me if you like. Your bread is mouth watering. I will try it and let u know the results. Just posted my (Canary) Melon Paletas. I still have to come back and post some others. ;-) Thanks for hosting a fun event Heathe! 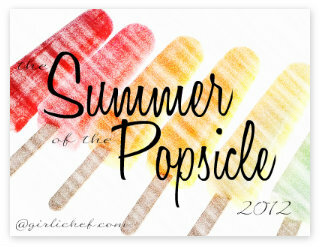 What a cute idea, I absolutely adore Paletas and so fun to have so many recipes in one place! Thanks!